Capno 101: What is Heart Failure? Heart failure, aka congestive heart failure or CHF, is a condition in which fluid builds up in the lungs and chest, making it difficult for the lungs to inflate and the heart to pump. Causes include myocardial infarction, hypertension and amyloidosis. CHF most often occurs due to chronic hypertension that diminishes the ability of the heart to pump blood, thereby increasing pressure in the pulmonary veins, which causes fluid buildup in the tissue surrounding the alveoli. This impairs the ability of the lungs to exchange CO2 and oxygen, causing the patient to become short of breath or stop breathing altogether. Chronic CHF results in nearly half a million hospital admissions each year and is a frequent cause of 911 calls for shortness of breath. Treatments range from drugs such as nitroglycerin, ACE inhibitors and diuretics (a secondary treatment) to ventilation support with continuous positive airway pressure (CPAP). Quantitative waveform capnography can serve as an accurate, noninvasive parameter to help EMS providers monitor a patient’s O2/CO2 gas exchange in initial assessments and to gauge the effectiveness of therapy. Labored breathing, wheezes and crackles can be caused by multiple conditions, including heart failure, asthma and pneumonia. Accurate diagnosis of the cause of respiratory distress is critical, but it can be difficult when the patient has difficulty speaking or suffers from multiple chronic respiratory conditions. When added to a thorough history and physical exam, waveform capnography is a valuable assessment tool to determine the severity of a CHF patient’s respiratory distress, to guide treatment decisions in the prehospital environment and to monitor the patient’s response to those treatments. Capnography monitoring can assist in the titration of CPAP treatment, using in-line capnography to monitor the status of the patient’s airway and perfusion to determine not only current status but also the efficacy of treatment. In a cardiac arrest scenario, etCO2 levels may be one of the earliest indications of return of spontaneous circulation. It can also identify how effective compressions are by measuring cardiac output and perfusion. The capnography waveform can identify and help to differentiate the causes of dyspnea or shortness of breath by providing an indication of reactive airway disease even before the typical observable increased expiratory phase begins. The patterns can also indicate cardiac output. 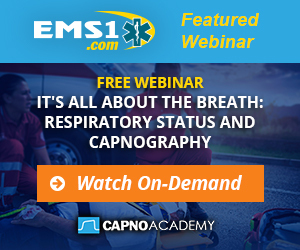 Using capnography, providers are able to make a much earlier and more educated decision on whether or not to intubate the patient to protect the airway or to avoid impending respiratory collapse. The American Heart Association provides information for providers on its Resources for Healthcare Professionals page and the Professional Heart Daily site. This study of 353 patients compares the use of resting end-tidal CO2 values to other resting variables to predict cardiac performance in patients with systolic heart failure. Subjects were followed for major cardiac events, of which there were 104 during the study’s tracking period. The authors conclude that because resting end-tidal CO2 “can be noninvasively collected from subjects in a short period, at a low cost, and with no risk or discomfort to the patient,” capnography is a valuable assessment tool. The Journal of the American Medical Association published a study aimed at simplifying guidelines for treatment of heart failure, noting that “clinical trials have proved that early detection can delay progression.” The authors conclude that “pharmacological treatment of heart failure has become a combined symptomatic-preventive management strategy” and that it is important to adjust the treatment regimen for each patient’s condition, using capnography for continued assessment.